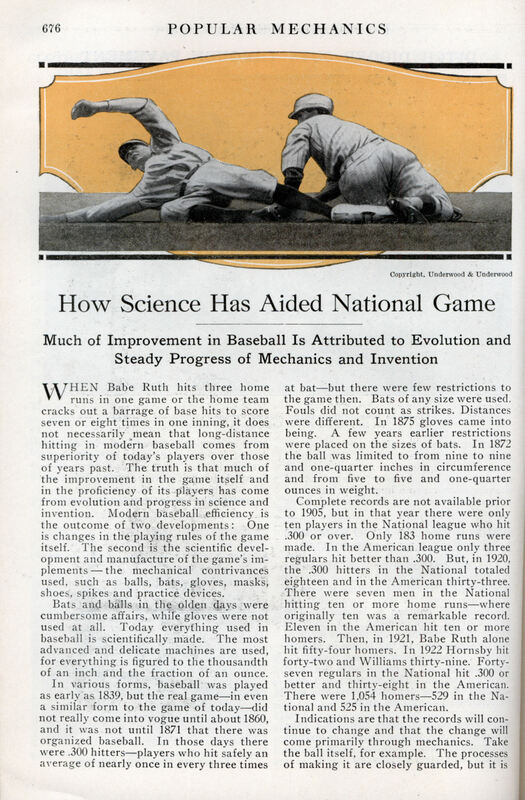 Much of Improvement in Baseball Is Attributed to Evolution and Steady Progress of Mechanics and Invention WHEN Babe Ruth hits three home runs in one game or the home team cracks out a barrage of base hits to score seven or eight times in one inning, it does not necessarily mean that long-distance hitting in modern baseball comes from superiority of today’s players over those of years past. The truth is that much of the improvement in the game itself and in the proficiency of its players has come from evolution and progress in science and invention. Modern baseball efficiency is the outcome of two developments: One is changes in the playing rules of the game itself. The second is the scientific development and manufacture of the game’s implementsâ€” the mechanical contrivances used, such as balls, bats, gloves, masks, shoes, spikes and practice devices. Bats and balls in the olden days were cumbersome affairs, while gloves were not used at all. Today everything used in baseball is scientifically made. The most advanced and delicate machines are used, for everything is figured to the thousandth of an inch and the fraction of an ounce. In various forms, baseball was played as early as 1839, but the real gameâ€”in even a similar form to the game of todayâ€”did not really come into vogue until about 1860, and it was not until 1871 that there was organized baseball. In those days there were .300 hittersâ€”players who hit safely an average of nearly once in every three times at batâ€”but there were few restrictions to the game then. Bats of any size were used. Fouls did not count as strikes. Distances were different. In 1875 gloves came into being. A few years earlier restrictions were placed on the sizes of bats. In 1872 the ball was limited to from nine to nine and one-quarter inches in circumference and from five to five and one-quarter ounces in weight. Complete records are not available prior to 1905, but in that year there were only ten players in the National league who hit .300 or over. Only 183 home runs were made. In the American league only three regulars hit better than .300. But, in 1920, the .300 hitters in the National totaled eighteen and in the American thirty-three. There were seven men in the National hitting ten or more home runsâ€”where originally ten was a remarkable record. Eleven in the American hit ten or more homers. Then, in 1921, Babe Ruth alone hit fifty-four homers. In 1922 Hornsby hit forty-two and Williams thirty-nine. 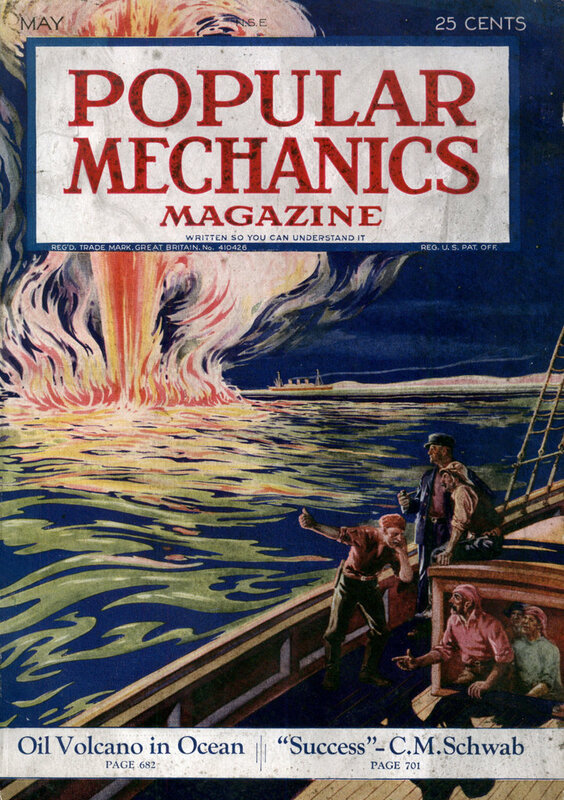 Forty-seven regulars in the National hit .300 or better and thirty-eight in the American. There were 1,054 homersâ€”529 in the National and 525 in the American. Indications are that the records will continue to change and that the change will come primarily through mechanics. Take the ball itself, for example. The processes of making it are closely guarded, but it is a work of finest mechanical craftsmanship. Years ago, it was composed of a piece of rubber wound with string. Later machinery gave definite size and shape to the rubber center, wound the string tighter and added a horsehide cover. Today the “lively ball” is credited with the increased hitting, and mechanical invention produced the lively ball. First, a piece of cork about three-eighths inch thick and fairly round is taken. It is chemically treated to give it extreme hardness and yet retain resiliency. Then, in molds, a rubber cover is made for the cork. This is one and one – quarter inches thick. It is constructed in halves and these are vulcanized together around the cork. The centers then are placed in a machine a dozen at a time. They are automatically turned, picking up the end of a fine linen string which is fed from balls. A thin layer of this is wound by the machine so tightly that it is as hard as rock. Then â€”automaticallyâ€”the finest grade of imported wool yarn is attached. It is made in varied thicknessesâ€”first thick, then thin, and so on. The change in the thickness gives tighter winding. A few layers of thisâ€”and the yarn must be first mechanically tested so as to prove its strengthâ€”and then automatically another layer of linen thread is wound. Now comes the only real hand operation. The covers are sewed on by handâ€”but they have been mechanically cut out of horse-hide by steel dies. Then a chemical preparation automatically tightens the cover, bleaches it and toughens it. thirty seconds a man feeds a stick into the lathe. Every thirty seconds a complete bat of any size or model desired comes out the other side where it is automatically loaded onto another truck. For professionals, some bats are hand-turned, but they are few. The lathed bat â€”with a protruding axle at each end to hold it byâ€”is then fed into an automatic smoother. As the bat is revolved, it pushes against sheets of mechanically revolving emery paper which smooth it off. Then a rubber with a specially made emery-paper glove gives it some hand touches and later it is mechanically oiled. The next machine chops off the axle ends of the bat and automatically carries these chips to the furnace. A machine stamps the name and model on the bat and it is ready to be packed for shipment. Sometimes it is specially colored first. An error of a thousandth of an inch or a fraction of an ounce in the distribution of weight in a bat or ball will cause a professional to send it back, but machinery has become so perfect that this seldom happens. Gloves are the development of scientific bats and balls which made hitting so hard that players had to have protection. Steel punches cut the gloves, machines sew them, mechanical cutters shape pads of felt for the interior. Original gloves were crude affairs with the padding just stuffed in anyhow. Now it is cut in layers, the thickness varying in spots to make a pocket for the ball. Catchers’ masks also have come through mechanics. The steel wire from which they are made is fed into a machine which â€”in the manner of a wash wringerâ€”twists the wire to proper shape. Then it is electrically welded together and padded mechanically. Chest protectors are cut and stitched together by machines. Some are padded, but the best are rubber-lined and inflated with air. Millions of people annually pay millions of dollars to see ball games, resulting in the erection of great stands such as the Yankee stadium in New York which seats over 60.000 persons. Here modern engineering, with all the mechanical inventions which accompany it, has come in. Automatic turnstiles to count the spectators, steel riveting, concrete and steel construction, surveying of the parks to regulate distances between bases to the fraction of an inch, scientific draining, the . level, the transit, the concrete mixer, the electric welder, derricks, cranes, steam shovels and such inventions, are just a few of the things that have enabled baseball to become America’s national game.